Los Angeles, CA-August 2018…BOMG Publishing is pleased to announce the release of The Music Business Advice Book: 150 Immediately Useful Tips From The Pros by top-selling music industry author and blogger Bobby Owsinski. The Music Business Advice Book is a compilation of 150 helpful quotes from 130 top music pros from various segments of the music industry. These experts previously shared these tips on Bobby Owsinski’s Inner Circle Podcast over the course of almost 5 years. The insights in The Music Business Advice Book are not only essential for those new to the music industry, but valuable to seasoned pros as well. Whether you’re a musician, artist, in a band, an engineer, producer, songwriter or music exec, there’s something in this book for everyone. 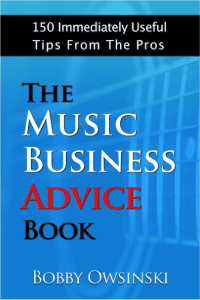 For a short time, The Music Business Advice Book carries a special introductory price of just $0.99 on Amazon’s Kindle store. The print edition is priced at $19.99. A table of contents and book excerpts can be found at https://www.bobbyowsinski.com/music-business-advice-book.html.